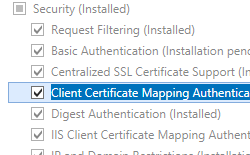 <clientCertificateMappingAuthentication> element of the <authentication> element specifies whether client certificate mapping using Active Directory is enabled for Internet Information Services (IIS) 7. 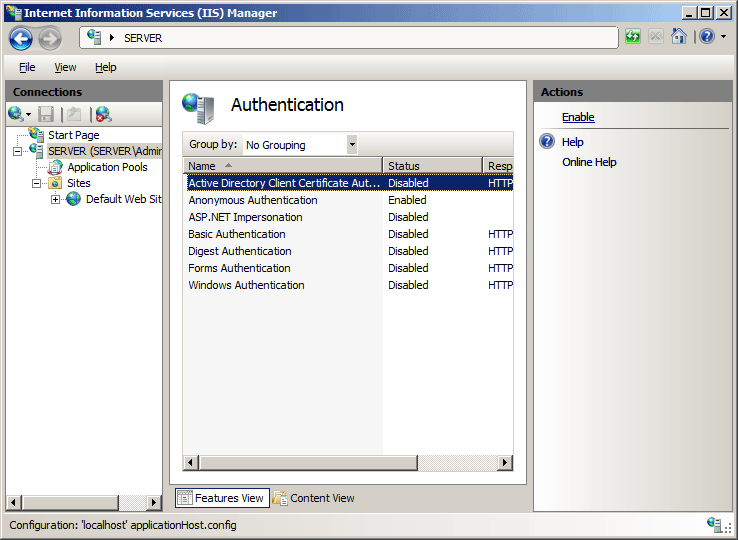 Client Certificate Mapping authentication using Active Directory - this method of authentication requires that the IIS 7 server is a member of an Active Directory domain, and user accounts are stored in Active Directory. This method of client certificate authentication has reduced performance due to the round-trip to the Active Directory server. 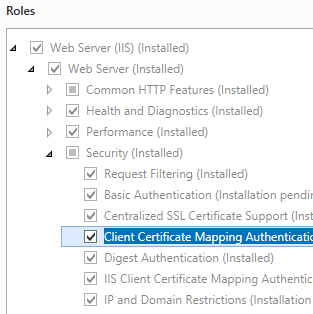 IIS Client Certificate Mapping authentication - this method of authentication does not require Active Directory and therefore works with standalone servers. This method of client certificate authentication has increased performance, but required more configuration and requires access to client certificates in order to create mappings. For more information, see Configuring Authentication in IIS 7.0 on the Microsoft TechNet Web site. 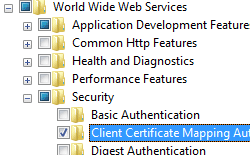 IIS 10.0 The <clientCertificateMappingAuthentication> element was not modified in IIS 10.0. 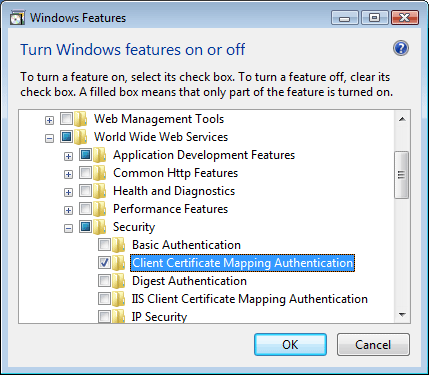 IIS 8.5 The <clientCertificateMappingAuthentication> element was not modified in IIS 8.5. 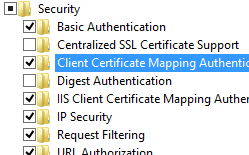 IIS 8.0 The <clientCertificateMappingAuthentication> element was not modified in IIS 8.0. 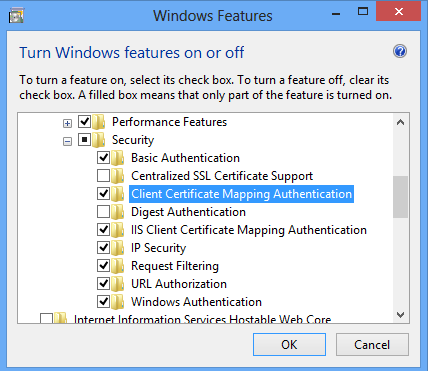 IIS 7.5 The <clientCertificateMappingAuthentication> element was not modified in IIS 7.5. 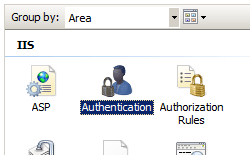 IIS 7.0 The <clientCertificateMappingAuthentication> element of the <authentication> element was introduced in IIS 7.0. 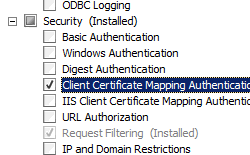 The <clientCertificateMappingAuthentication> element is not available on the default installation of IIS 7 and later. To install it, use the following steps. 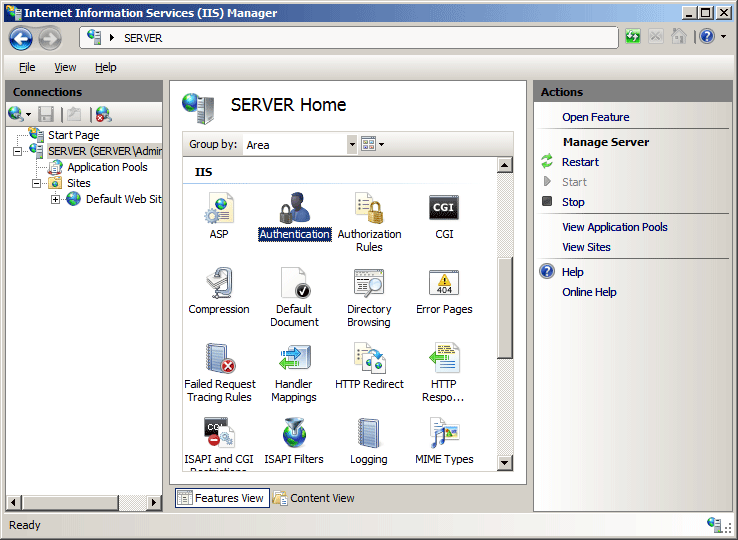 On the Server Roles page, expand Web Server (IIS), expand Web Server, expand Security, and then select Client Certificate Mapping Authentication. Click Next. Expand Internet Information Services, expand World Wide Web Services, expand Security, and then select Client Certificate Mapping Authentication. 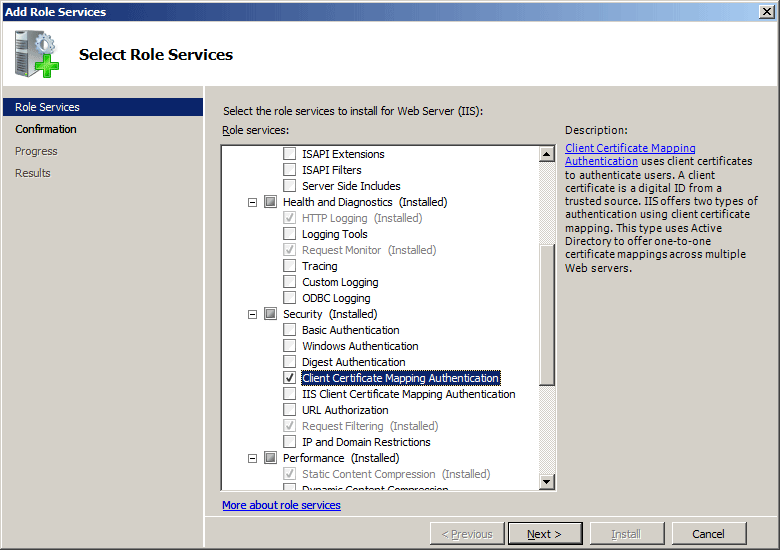 On the Select Role Services page of the Add Role Services Wizard, select Client Certificate Mapping Authentication, and then click Next. Expand Internet Information Services, then select Client Certificate Mapping Authentication, and then click OK. In the server's Home pane, double-click Authentication. On the Authentication page, click Enable in the Actions pane. 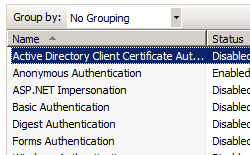 Specifies whether Client Certificate Mapping authentication using Active Directory is enabled. For this setting to take effect, you must set this attribute with IIS Manager. If you use any other method to set this attribute, you must restart the Web server for the setting to take effect. The following configuration sample enables client certificate mapping authentication using Active Directory for the Default Web Site, and configures the site to require SSL and negotiate client certificates. The following code samples enable client certificate mapping authentication using Active Directory for the Default Web Site, and configure the site to require SSL and negotiate client certificates.